I might have done something terrible. And by terrible, I mean really, really fantastic. I don’t know. You might think it’s bad. Did I disgrace a piece of pie by tossing it in a blender? Or did I just make the most incredible treat to ever grace my kitchen?! That’s a really bold statement, I know. To say it’s the greatest treat is just absurd considering how many things I make daily. BUT. This one is special for a really crazy reason. It made me love the pie. Yes. You read that correctly. The shake made me love the pie. You’d think it would be the other way around. No? I’m super weird about berry seeds. I love all fruit. I freaking love ALL fruit. I adore it, I could eat it for every single meal. It’s where my sweet teeth originate. I was born with a strong adoration for all things fruit and no things veg. The only thing I don’t love are the berry seeds in my teeth. Which is weird, since I love seeds that pop in figs and things like quinoa and what not. But berry seeds just, like, disappear into your mouth only to reappear later and do nothing good. So my mom’s been super into these berry pies (the best are found here) and we had a whole heck of a lot of them over the 4th of July weekend. I didn’t even taste them because pie is not my poison of choice AND the seeds – it was like a double whammy. There were so many other treats that I wanted to splurge on that I ignored the pie. I mean I couldn’t help it. But then! We ended up with lots of pie and I wondered… just for a moment…. what would happen if I actually THREW a slice into the blender. The idea was fleeting. 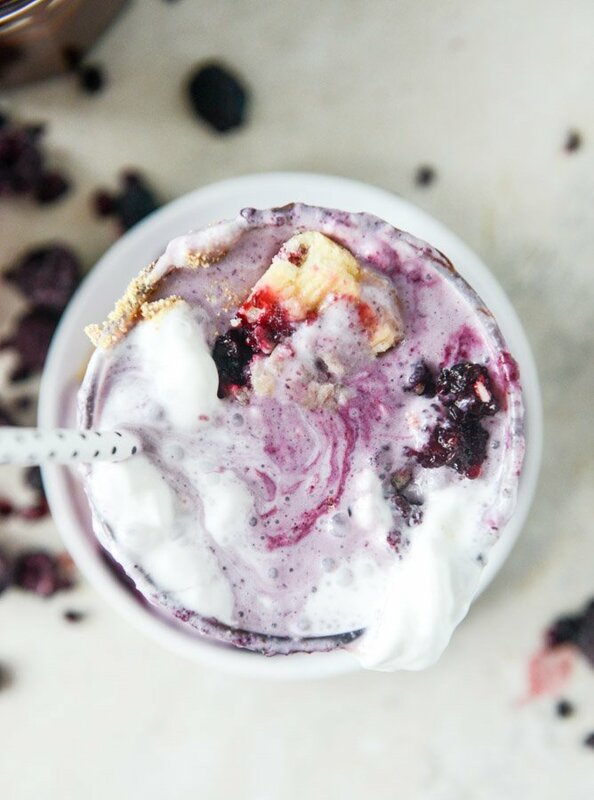 Instead of trying to recreate the whole “berry pie milkshake” thing by adding different fruit and flavor and textures, I figured I’d make it easy on us and just add the pie itself… to the blender. No recipe development here! Have pie. Will add to blender. I took one sip and was BLOWN AWAY. Holy cow, you guys. I could not believe how delicious this was – I was not expecting it. 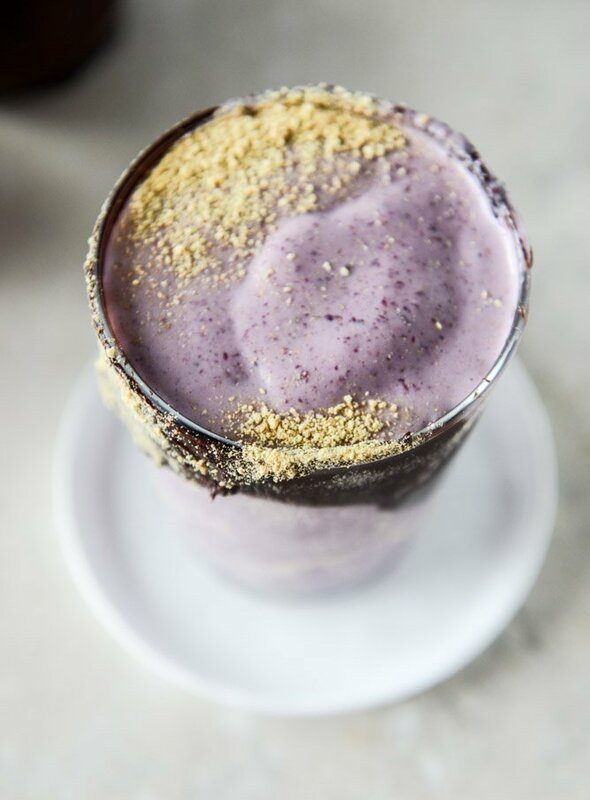 The filling lends the sweet, fruity touch to the shake but the crust adds that cookie-like flavor with a hint of nutmeg and practically makes the drink taste like cookie dough. And then of course I HAD to taste the pie. And I died. On top of that, I didn’t want to be as embarrassingly simple as I was already, so I made a chocolate ganache fudge with black raspberries and then slathered it inside and on the outside of the glass. I tossed some graham cracker crumbs on the fudge just for fun. And topped it with MORE PIE. That’s always the answer. To any question you need, from here on out. More pie. Place the black raspberries in a bowl and microwave until warm and some juice is released. Mash the berries with a fork as much as you can. To make the fudge, heat the heavy cream in a saucepan over low heat until the edges just bubble and the cream is warm. Place the chopped chocolate in a bowl. Pour the warm cream over top and let sit for 30 seconds, then stir until the chocolate melts. This will take a few minutes! 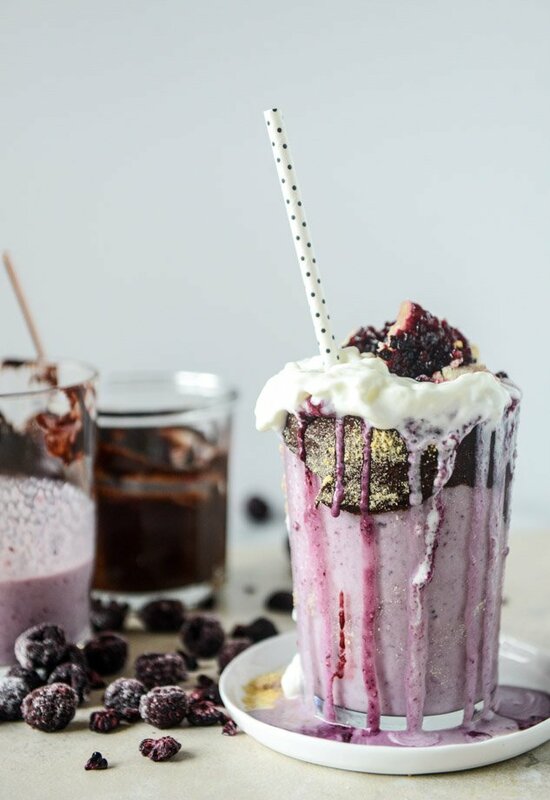 Once the chocolate is melted, stir in the black raspberries and any juice. Stir stir stir to make it come all together. Rim the insides of the glasses with the chocolate. Spread a bit on the outside of the glasses too. Sprinkle graham crumbs on the chocolate. 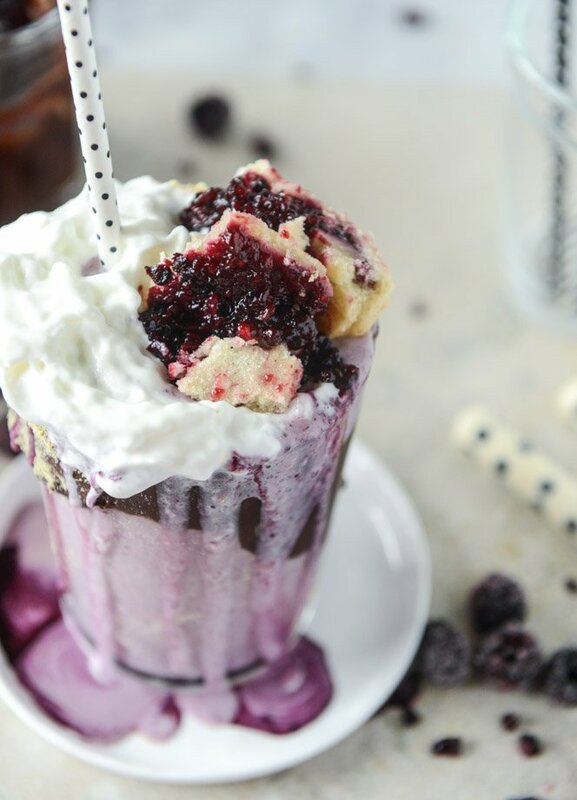 Place the pie, ice cream and milk in the blender. Blend until pureed then pour in the glasses. Serve! I decide that this is BEYOND fantastic. Wowza. Yes, this is certainly a terribly fantastic creation! I love that you literally added pie to this amazing creation! What a great way to use leftovers! 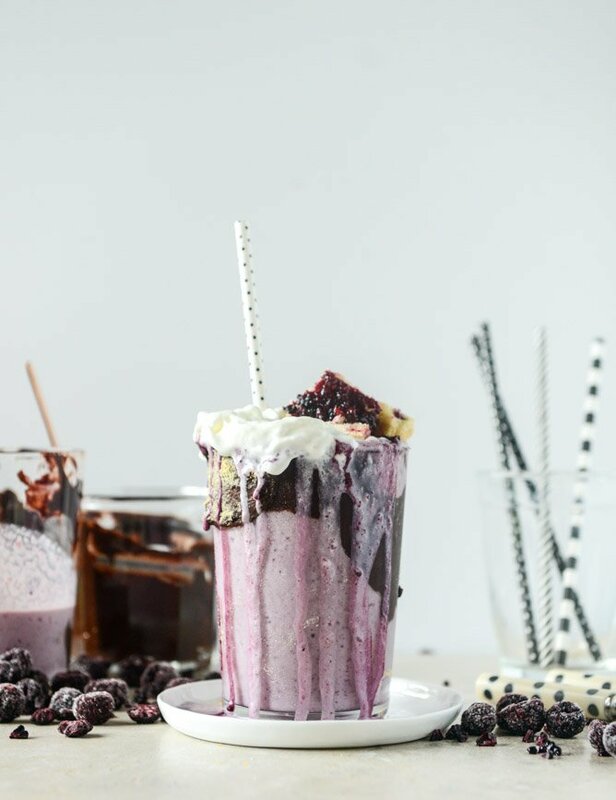 These milkshake just made the top of my MUST-TRY list!!! Black raspberries > blackberries. Sadly, I cannot find black raspberries at the store. We used to have a bush growing wild in the alley behind my mom’s house, but someone tore it out (who DOES that?!). Ugh, I hate raspberry seeds. Love everything with berries tho! 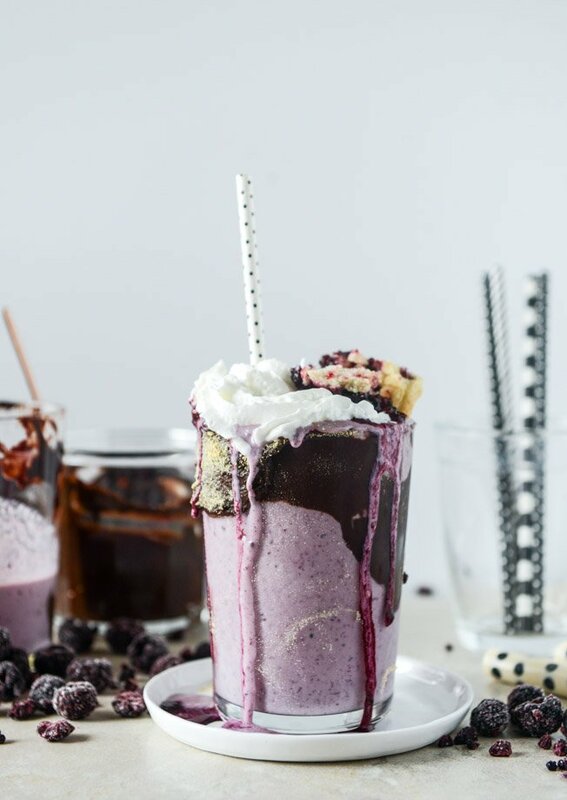 The shakes look amazing, from the color to what they probably taste like. I want one for breakfast. Your ability to make a mess is outstanding. It’s just so YOU! I love it! And somehow it looks hip and delicious! 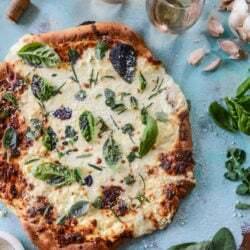 Keep on being you :) You’re my go-to for recipes for eeeeverything! And neon accessories. Duh. I know a man who wants to marry you right now! LOL seriously my better half begs me to put cake and pie in milkshakes ALL the time. 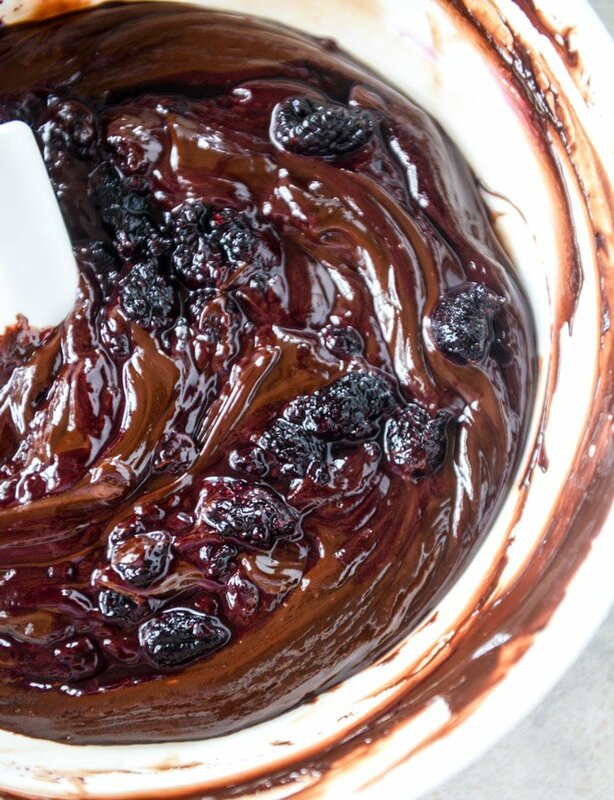 This black raspberry fudge sauce sound incredible. Holy (words I can’t say because all other words are failing to describe what I’m feeling)! This is bananas, or berries. I can’t handle it. But I want to. Because I’m pretty sure that my husband will do literally anything I ask of him if I make this for him. Thank you for being my husband whisperer <3 P.S. I feel you with the no time for pie sentiment when there are desserts like Ina's flag cake and a million s'mores to consume. Oh my. The color of this is just glorious! And I’m obsessed with baked goods in milkshakes. This needs to happen today! 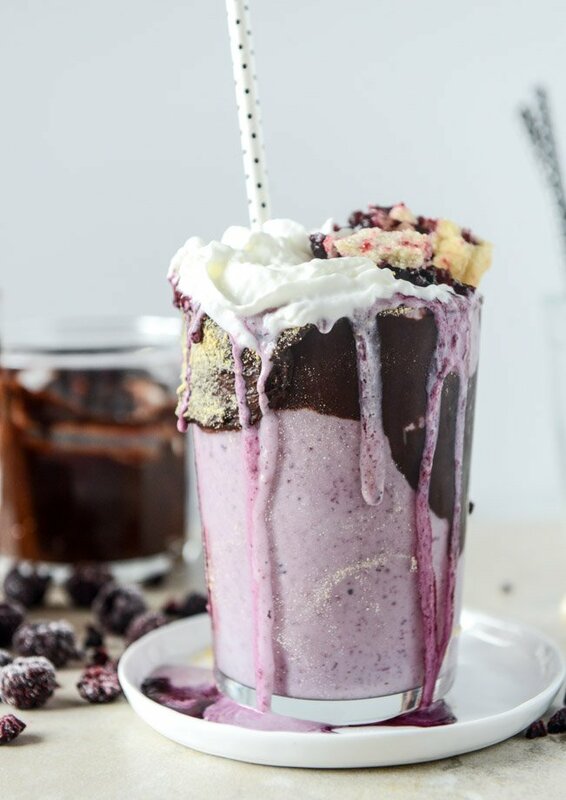 There was a tiny burger joint in Utah for a while that did pie shakes and cupcake shakes. They were incredible, and I’m super bummed that they’ve now closed down. I don’t have leftover pie around me often, but I’m starting to wonder if I should go ahead and make myself a pie so I can get a taste of a pie shake again. You are quite literally a sweet genius. 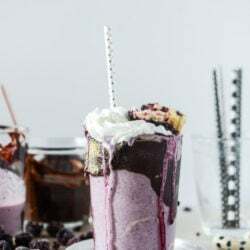 :) I’m with you on berry seeds and fruit pies have never been my fave, but I bet I would loooove it in a milkshake like this! Seeds or not I would gobble up every drop! Whoa! That is an awesome idea, and totally outrageous, in a good way. 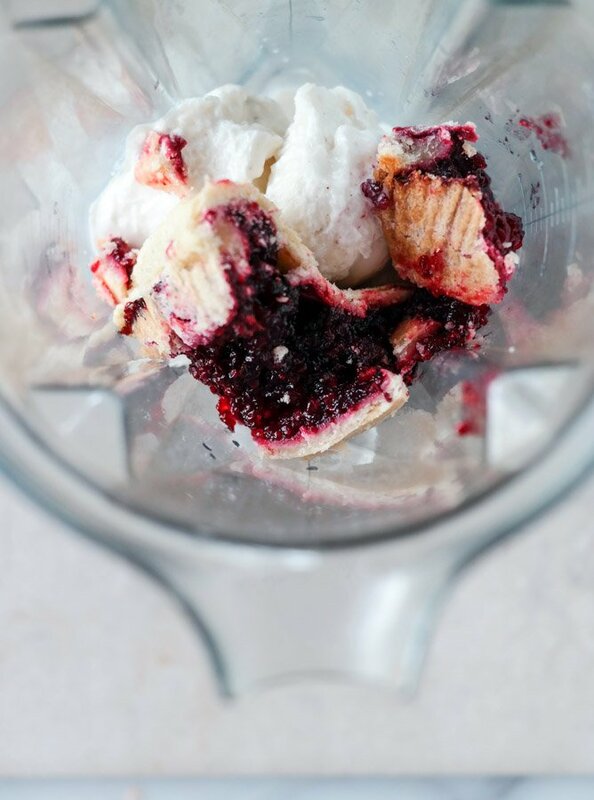 Blending pie might also be something to play around with to make ice cream… Also, how do you manage to make mess look so good?! This is GENIUS! Since it has raspberries can we pretend it’s a smoothie and eat it for breakfast? Ummmm I may sound stupid here, but I’m never seen black raspberries. I mean, I know raspberries, and I know blackberries, but what are black raspberries??? OMG! JAW.DROPPED! Best pie ever! I love that you said the milkshake made you love the pie! hahaa!! 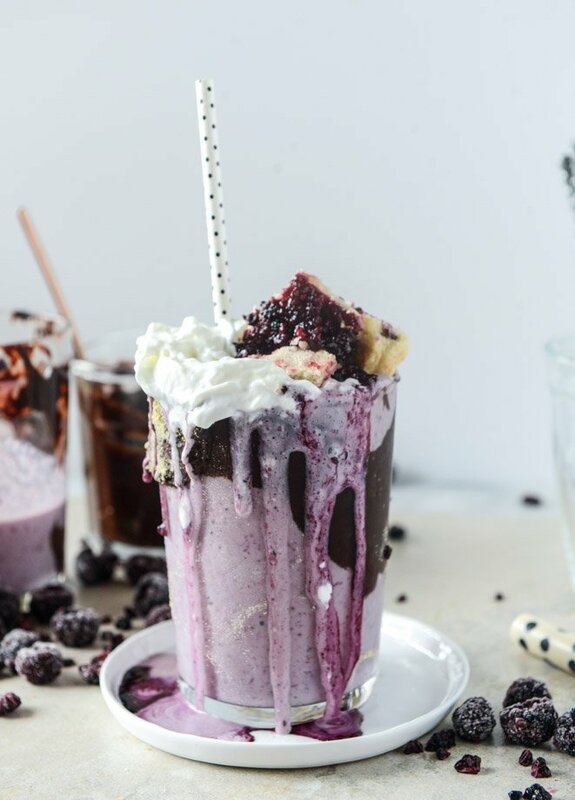 This looks downright decadent and if ever in the future, there’s a new technological development where you can pick food straight from the screen, this milkshake is where I’d start first! But for now, I’ll just make myself a big batch of this beauty! Black raspberries are the best! My sister and i are going picking tomorrow! Black raspberry pie is awesome! I love berry pie…and cherry. Pretty much any pie. :) Looks awesome! Oh my word! 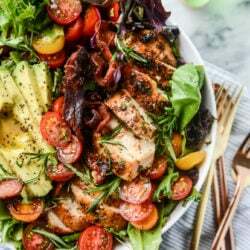 This is incredible – YUM! I bet this would be so good with cherries/cherry pie too! Love it. Insanity at its best! Brava!! This looks worth breaking the law for to get and gobble down… slowly! two days ago grey McLaren. P1 I bought afterearning 18,513 Dollars..it was my previous month’s payout..just a littleover.17k Dollars Last month..3-5 hours job a day…with weekly layouts..it’s realy thesimplest. job I have ever Do.. I Joinedd This 7 months. ago. and now making overhourly. Wow! Looks delicious! I’ll take two!